When I see a horseshoe crab I feel transported back in time. Horseshoe crabs roamed the continental shelves of the primordial seas 200 million years before dinosaurs roamed the earth. The oldest animal fossil ever found was from a horseshoe crab dated to 445 million years ago and they are oftentimes called living fossils since they are virtually unchanged since the Mesozoic Age and have no closely related ancestors. 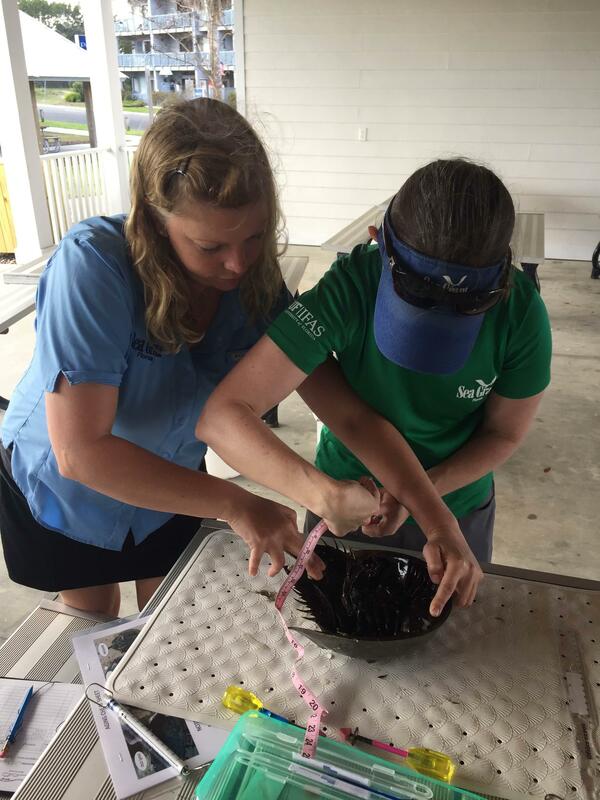 Sea Grant agents measure a horseshoe crab. In the Keys, we are most likely to interact with horseshoe crabs when they crawl out of the water to mate at the high tide line, especially during full and new moons. The larger female will have one male attached and multiple “satellite” males surrounding her. This behavior has evolved to encourage genetic diversity for the fertilized eggs, which will hatch about two weeks later when the next spring tides at full and new moons wash over the eggs and return them to the sea. While there is no word to describe a congregation of horseshoe crabs, like a bale of turtles or a fever of manta rays, I can tell you that they are really not crabs at all – they are more closely related to spiders and scorpions rather than the true crabs, like blue crabs. Their bodies are organized very uniquely – the mouth is in the middle of their 10 legs and they have eyes on the top of their bodies and even on their tail – called a telson. Some people think the telson at the end of their body is a stinger, but that isn’t true either – it is not involved in defense at all, it’s there to turn them right side up when they get flipped over by waves or predators. Horseshoe crabs are harmless to humans, as a matter of fact, if you have ever had surgery you may have a horseshoe crab to thank for preventing you from getting an infection. They have blue copper-based blood that reacts when it encounters bacteria, so horseshoe crab blood is used in the medical industry to ensure products placed inside the human body are sterile and won’t cause infections. 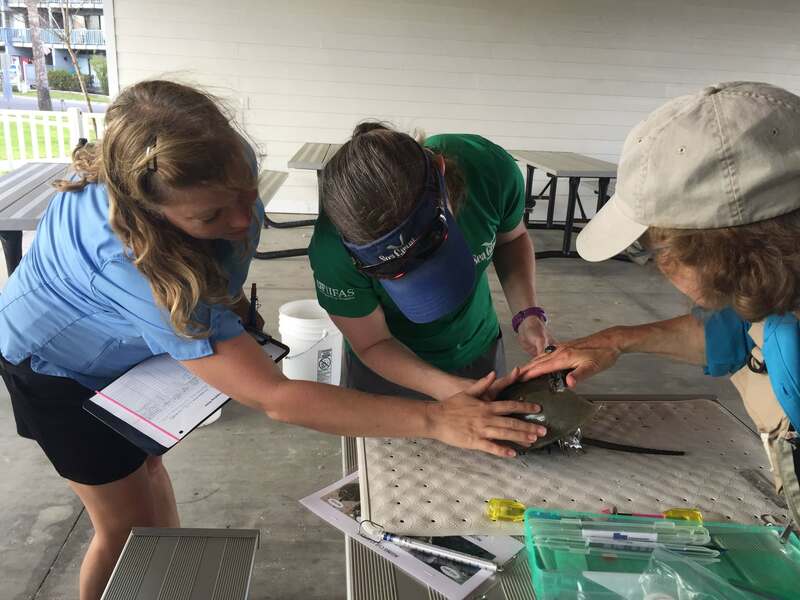 Sea Grant agents measure and pet a horseshoe crab. After spending a day measuring, weighing, and tagging horseshoe crabs, I have gained a new appreciation of their complex reproductive behavior, which they’ve had 450 million years to perfect! Around 10 years of age, the males and females have one final molt, where they shed their old shells to grow larger. The males develop “boxing gloves” on their front claws, this allows them to attach to the females for up to 3 weeks at a time. The males are unable to feed while attached and the female drags him around behind her up to the beach to lay eggs and then back to the sandy bottoms where she eats clams and worms. In Delaware Bay, horseshoe crabs come ashore to breed by the tens of thousands but those numbers have been declining. We don’t know a lot about the horseshoe crabs that live in the Florida Keys, and there have not been many recorded sightings of more than 100 individuals at a time. data on these (literally) prehistoric animals. This is part of a larger horseshoe crab data collection program along the Gulf of Mexico and Atlantic Ocean. In Florida, we are trying to estimate the breeding population size and find out areas they may return to year after year, since horseshoe crabs live about 20 years. In order to determine if the population is increasing, decreasing, or stable, we are looking for volunteers to keep an eye on nesting areas and report sightings. If you would like to be involved, we are looking for people to report the sightings to me, or using the FWC Smartphone app called FWC Reporter. 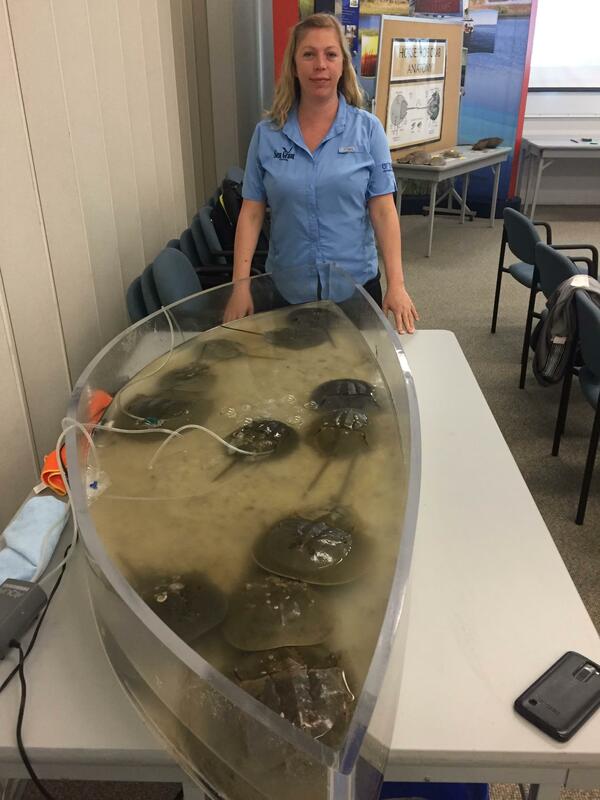 We will be holding workshops later in the year to educate people about the fascinating world of horseshoe crabs and training to tag and count. For more information, please contact Shelly Krueger, Florida Sea Grant agent for the UF/IFAS Monroe County Extension, 305-292-4501 or shellykrueger@ufl.edu.